​Take some thin white paper (such as computer paper) and a dark crayon, and use the side of the crayon to make crayon rubbings of the bark texture of several trees. 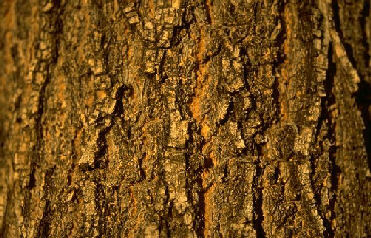 Observe the various textures and colors of the bark on different trees. Use a magnifier. Find some bits of bark on the ground and collect them. ​Bark is the “skin” of a tree, and protects inner part of the tree from severe weather and harsh sun, bumps from animals, helps retain water, and even protects from forest fires. ​​In previous times, people made things from tree bark. Let’s think of something you imagine it could have been used for. Children give creative answers, then discuss real uses, such as boats, shelters, carryalls etc. If you can scavenge some bigger, bark pieces, try bark painting, in the style of Australian Aboriginal painting. Use traditional colors- yellow, brown, black and white. Create a wall display of different kinds of bark and label them. This topic could lead to interest in other parts of trees, different types of trees, or even a project about forests.